Fabric shop/dressmakers on London Road. It was previously in the unit next door, but moved here some time around the start of 2019. As of March 2019 the signage is still for Amani, a previous occupant. The premises were built around 2009 as part of the iBuilding development, which stands roughly on the site of the now-demolished Safari Cinema photo from November 2001 photo comparison between 1936 and 2010. This cinema was previously known as the Cannon, the ABC, and the Savoy; it was finally demolished in spring 2005. See Cinema Treasures entry and Wikipedia for more details. By March 2012 this unit was occupied by a bridal boutique and event planners called Amani photo. They also offered venue decoration, and sold sarees and Indian jewellery. 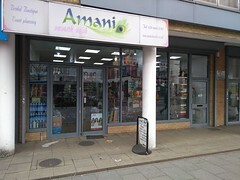 As of May 2014 there was a sign in the window stating that Amani was for sale. However, an email from the owner in June 2015 confirmed that they decided not to sell in the end. As of July 2018 notices stated Amani was closing down soon and was having a half-price sale (which was still going on as of October 2018). It finally closed some time between then and January 2019. Last edited 2019-03-21 11:59:18 (version 42; diff). List all versions. Page last edited 2019-03-21 11:59:18 (version 42).